Last Wednesday -- which was the worst day for both the dollar and US equities -- the average price of US Mint-manufactured gold rose to $1952/oz. That's about $130/oz higher than gold futures got that day. Meanwhile, Gold continues to break all-time records as uncertainty and lost of confidence hammer the U.S. dollar. There were times Gold was even at par or more with Platinum which were never seen before. 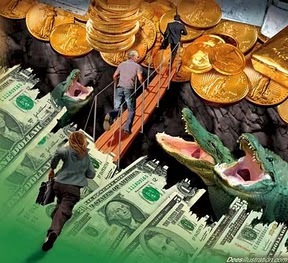 Gold dealers on Ebay continue to profit from the market tremors brought by the sudden surge in the prices of precious metals especially with Gold. In demand right now are bullion coins most likely falling from .900 or of higher purity. Bangko Sentral Ng Pilipinas (BSP) expresses that despite the falling value of the dollar, they are still confident with the beleaguered currency as the current dollar reserve rose to %16. Though BSP remained optimistic with the current economy as credit rating agencies upgraded the Philippines credit worth to BB+, changes in the prices of commodities such as oil and wheat have become the headaches of most economist as prices become more unstable and harder to forecast. Bargain hunters in the Quiapo black market are scouting the area for possible opportunities since local bullion market still takes a while to adjust and effect of the price changes in COMEX is slower. Local auctions are now attended more than ever by precious metal prospectors rather than collectors as more and more players now participate in the trade of precious metals especially with Gold.